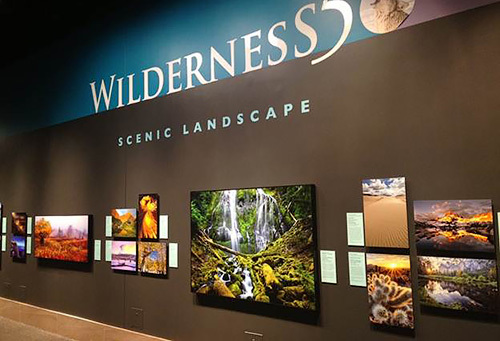 Epson has announced its sponsorship of Wilderness Forever: 50 Years of Protecting America's Wild Places opening today at the Smithsonian National Museum of Natural History in Washington, D.C. The exhibit celebrates 50 years since the passage of the Wilderness Act with an exhibition of juried photography selected from over 5,000 entries. Epson is the official inkjet printer and paper partner for the exhibit, which is dislayed in large format prints. Steve Freligh, executive director of the awards program, said, "Epson's exhibition-quality printing allows museum attendees to enter a different world when they view these photos, showing the detail and natural beauty we are trying to capture with this exhibit." The prints were made on a 44-inch Epson Stylus Pro 9900 using Epson UltraChrome HDR ink. The exhibition's Web page invites viewers to vote for a favorite image. "Each month, the photograph with the most votes will be highlighted as that month's winner. Votes are limited to just one person per day, but come back often to make sure your favorite is selected." LONG BEACH, Calif. -- Epson has announced it is a global sponsor of the new exhibition "Wilderness Forever: 50 Years of Protecting America's Wild Places," which opens today at the Smithsonian National Museum of Natural History in Washington, D.C. Marking 50 years since the passage of the Wilderness Act -- one of America's most successful and enduring pieces of conservation legislation -- Wilderness50, Nature's Best Photography and the Smithsonian Institution are hosting an exhibition of juried photography highlighting the beauty, diversity and longevity of America's wilderness. As the official inkjet printer and paper partner for the exhibition, Epson's professional printing technology enables visitors to experience the award-winning photography of "Wilderness Forever" in its purest form, as a photographic print. Visitors to the Smithsonian National Museum of Natural History in Washington, D.C. will see award-winning photographs selected from over 5,000 public entries submitted nationwide. The images are displayed as large format prints in the nation's most visited museum, which welcomes more than eight million visitors annually. "Epson has been a strong supporter of the Nature's Best Photography Awards for several years in a row, so when it came time to find a printer and paper partner for the Wilderness Forever' exhibit, they were our first choice," said Steve Freligh, executive director of the awards program. "Epson's exhibition-quality printing allows museum attendees to enter a different world when they view these photos, showing the detail and natural beauty we are trying to capture with this exhibit." The exhibition-quality prints were created with Epson's award-winning 44-inch Epson Stylus Pro 9900. With the precision of its Epson MicroPiezo TFP printhead and the performance of Epson UltraChrome HDR ink, the printer delivers superb photographic prints with an extremely wide color gamut and incredible sharpness. Used with Epson Professional Papers, this advanced printing technology produces rich blacks and smooth tonal transitions. "America's wilderness is surely something to be treasured and appreciated and we are honored to be associated with the Wilderness Forever' exhibit which captures the breathtaking beauty of this country," said Larry Kaufman, product manager, Professional Imaging, Epson America, Inc. "Our goal is to provide the most advanced printing technology available to help photographers accurately reproduce the beautiful wildlife and scenery they view and capture in real life." The exhibition will be viewed by millions of visitors at the Smithsonian National Museum of Natural History located on the National Mall in Washington, D.C. and is open daily free to the public. For more information about Epson professional printers, visit http://proimaging.epson.com.